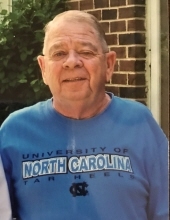 Durham: Joseph Jackson, 74, died Monday, December 3, 2018, at Hock Family Pavilion. He was born in Durham, the son of the late Robert Lynwood Jackson and Beatrice Gray Jackson. He was predeceased by his wife, Anna Jackson and brother, Raymond Bo Jackson. He was a veteran of the U.S. Navy and was a Computer Technician. Mr. Jackson is survived by his sons, Randy Jackson and wife Kim, Christopher Chad Jackson; grandchildren, Jacob and McKenzie Jackson and brother, Marvin Jackson and girlfriend Wendy. The family would like to express their appreciation to the staff at Treyburn Rehabiliation Center and Hock Family Pavilion. In lieu of flowers, memorial donations can be made to Converting Hearts Ministries, 15033 Creedmoor Rd, Wake Forest, NC 27587. To send flowers or a remembrance gift to the family of Joseph Jackson, please visit our Tribute Store.